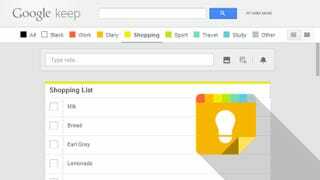 Google Keep is a handy note-taking and list-making tool that works across Web and mobile, but it's hardly overrun with features. Perhaps that's part of the point, but you feel that with a little more care and attention Google could have a seriously useful app on its hands. Category Tabs is a Chrome extension that brings some extra functionality without spoiling the minimal aesthetic. Once you've installed the extension from the Chrome Web Store you'll see a new list of categories at the top of the Google Keep interface. Click on any of the options to filter your notes based on that category. To begin with, these labels will just be the colors you've used in the app, but you can change the headings by going into the extension options (Tools, Extensions). If you've got stacks of virtual Post-its in Google Keep, Category Tabs does a great job of helping you sort through the clutter. It slots neatly into the app's existing interface and can be easily uninstalled without leaving any trace. If you haven't been tempted to use Google Keep thus far, this extension might change your mind. An Android app version would be welcome, too.